You might not be aware of this, but Team Cherry’s debut game, Hollow Knight, started off as a flash game. It first appeared on Newgrounds as Hungry Knight, which is still playable. Ari Gibson and William Pellen talked about its humble beginnings in a recent interview. That’s right. Prior to being a silent badass prowling the underworld of a malevolent insect kingdom, our silent hero was once just a creature that wanted some food. The artistic style of the protagonist and enemies is immediately recognisable. 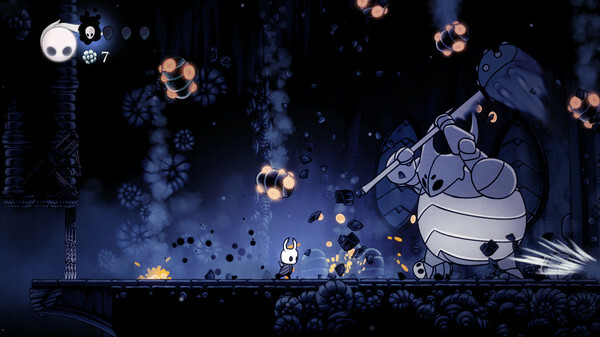 The gameplay, however, is nowhere near the many achievements of Hollow Knight, but everything starts from something. Ari Gibson and William Pellen met fifteen years ago,and hadn’t worked on a game together until they began entering game jams together. If you’re unfamiliar with game jams, they’re an event of sorts where developers come together to create video games in a short span of time, usually beneath a theme. One particular game jam had given birth to Hollow Knight’s core conception thanks to a “Beneath the Surface” theme. Shortly after [Ludum Dare] there was another jam with the theme ‘Beneath the Surface,’ which we thought was really evocative. We missed the deadline for the jam, but we kept talking about what sort of game we could make that would fit. We thought of the little insect knight exploring a deep, old kingdom beneath the surface of the world, and everything kinda snowballed from there. It’s inspiring to see something become an international success from humble beginnings. Hollow Knight recently came to PSN last month in September with every available DLC, and will soon be getting a physical release. Have any of you jumped into the world of Hollow Knight, yet? Let us know in the comments.